joy magnetism: "You see, today I am *living. 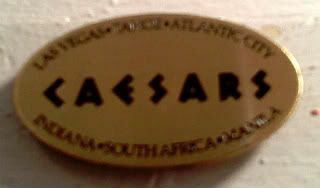 *"
I have a couple of magnets from Caesars - one from Vegas and one from Atlantic City. I'll use the other one to rave about how much the Vegas Caesars freaks me out so much with their animatronics and scary thunderstorms. But this one, I have to use today for a couple of reasons. When I woke up this morning, I was planning on finishing up a book (yes, I know, I was reading), then running out to get a camera to finally replace the crappy and crapped out Nikon Coolpix (a brand which I will never, ever buy again, based on most of the almost 800 magnet pictures you see here on joy magnetism), getting passport pictures done (because I can't believe I let my passport run out last month and what if my Italian prince finds me and I don't have my passport ready? ), and then coming home in time to watch the UK episode of Doctor Who (which was the best yet, with Amy Pond, who is poised to become my favorite companion). Alas, there were already a dozen work emails in my inbox this morning by the time I woke up, which of course, knocked the day and this night (still, because I seriously just emailed it out not ten minutes ago, and it's already 12:44am Sunday) for a loop (hence the crappy picture resolution above). I had to use this magnet to tell ya'll about one of the best books that I've read in a while. I mean, a friend of mine read it ages ago in manuscript form and really raved about it, and I was completely like, really? Cuz it sounds like all the heroine did was a bucket list. I generally admit when I'm wrong. And I'm admitting it here. I was wrong. She was right. And now you must all run out and buy Sarah MacLean's Nine Rules to Break When Romancing a Rake. While it has the longest title ever, and one that I can't believe she convinced her editor and the cover art director to keep, it's also the one book that has managed to capture my rapt attention all the way through to the final page. And believe me when I say there are at least a dozen books (of all genres) sitting on these bookcase shelves with bookmarks in the middle of them. It's the charming, engaging, and downright funny story of Lady Calpurnia Hartwell, who has been stuck overlong in Spinster Seating, and the hot Marquess she's been dreaming of for nearly a decade - ever since their first meeting in a darkened maze, when he recognized her namesake as Caesar's Empress (hence the magnet). In an attempt to live, Callie's written a to-do list to help push her clearly off the shelf. And that's all I'm going to say, because every one of her adventures is just that. One adventure after another. Fantastic. I kinda just realized right now as I'm typing that I won't be able to write a review about this book, because it'll just turn into some combo of edit letter/cover letter, listing all the things that I loved about it, and all my minor edits, and all the things to look out for on the next book. But, that's not my job anymore. And, for once, I'm glad. I loved reading this book, for the sake of reading romance. For the sake of reading. I'll just say that clearly, I really enjoyed it, as I've totally been SimulTweeting my reading of it over the past 24 hours, I'm sure, bugging the bejeepers out of my Facebook friends. I don't care. Go. Buy the book. You'll love it. Dudes. See? Backordered. That's because it's so good. That's why I said Run. Out. And. Get. It.